K.R. Mangalam World School, G.K.-II held the Scholar Badge Ceremony on 28 April 2018, to honour and felicitate the exemplary scholastic achievements of the students. This day being an extremely significant and momentous day, marked the recognition of students who have showcased their academic prowess and proved their worth as a Mangalite through sheer hard work. The ceremony began on a propitious note by invoking the blessings of the omnipotent Almighty and the ceremonial lighting of the lamp by the panel of distinguished guests. The function was presided over by the Chief Guest of the day Sri Madhup Tiwari, IPS , Joint Commissioner of Police, Western Range, Delhi Police, the Vice Chairman Dr Jai Dev, the Academic Advisor Dr Ashok Arora . 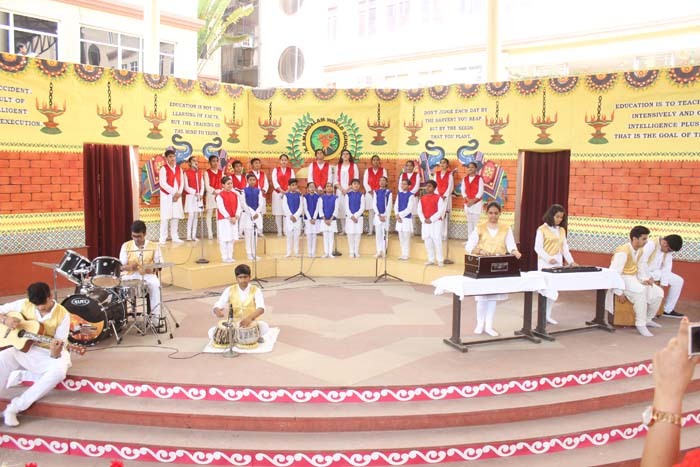 This was followed by a melodious rendition of ‘Ud Chale’ , an inspirational song sung by the musically endowed singers of the school to soar greater heights of achievements. The Principal, Ms Alka Awasthi addressed the august gathering and motivated the students to have a vision that decides whether one sinks or soars in the flight of life. Superb winners are the ones who display a mastery of their vision before their competence. This was followed by the moment that all the proud parents and guests were waiting for- the Scholar Badge ceremony. Students were handed over their hard earned awards by the revered guests. Sri Madhup Tiwari exhorted the students with his stirring speech and real life anecdotes. He stressed upon the fact that with recognition comes responsibility and that each individual should be prepared to shoulder the mantle of excellence that he/she has chosen. The graceful and artistic dancers of the school presented ‘Conglomeration’- A Unifying dance performance and held the spectators spell bound. The ceremony concluded with the vote of thanks by the Senior School Coordinator, Ms Ritu Sachdeva followed by the National Anthem.